I'd like to build it as a club. Funds from 180GO! will buy the material, you guys supply the labor. I'm thinking smaller than the one in the photo, maybe about 12 feet tall. What do you think? Who wants to help sew this puppy? Here's a colorizer you can use to play with colors. My initial idea is to make it in club colors (red,white,black). Since white gets dirty, I was thinking of keeping it to black & red. But throw out any ideas you have. *** actually two ideas. I just realized I colored the colorizer one way and the little photo in the corner the opposite way. Last edited by Mike on Sun, Sep 27 2015, 02:13 PM, edited 1 time in total. I like the one that is all red with the black sections scattered on it. The last colorized above. I'll edit the post and number them, but to me, one has red stars and the other has black stars. Mikey, you like version 3? The one with black pentagons. Think of the design as a traditional soccer ball. Except that each Pentagon or Hexagon is now a pyramid. The design has problems with the wind pushing in the spikes. 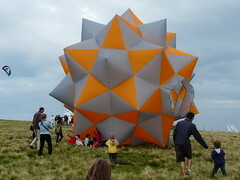 The spiky ball had a little of that trouble in light winds, but this seems much worse. Actually, I don't know if it's a real problem, it's kind of interesting in it's own way. Yup, version 3. I think the simpler layout looks great. Reminds me of an old 8 bit video game. I watched the video, would it be possible to make the yellow star sections radiating out from the hole out of screen, or partially out of screen? Might get rid of that low pressure area that causes the spikes pushing in. Although I also don't think it is a major distraction. Like you said, it is a little interesting watching it. Venting is the first thing that occurred to me to too. Then I remembered doing experiments with my spiky ball. WIth the ball I made a one-way valve which helped to keep it inflated in variable wind and reduced the push-in problem. We could also replace the spikes above the opening with flat eyes to make the whole thing a hedgehog. I'm thinking we need to add eyes. Kids will be more attracted to it that way. Bouncing this topic back to active as well as the sewing discussion related to Black Friday. I think I like the one with the black "stars" with a red spike in the center. In other words, the same as the original design (but in IKE colors). I just got back in town, I'll work on a version with eyes to see what people think. I'm willing to buy the materials on behalf of IKE if someone(s) wants to sew it. It would be good to have at IKE/180GO! festivals. Are you going to make a Megamon too? Anyone else want to help sew an IKE megamon? But . . . . we're heading into peak flying season. Rainy days only please. Wanting to help and available time are two different things. Weekends are a bit tough for me right now as I've been out of town a ton the last couple months (for work and fun), and so I need to commit time to some family stuff. Yup, I'm planning on building one for me. Sent a message today to get materials. This is a really straight forward build it should not take long. Resurrecting this thread in case we want to try to get this project started this fall / winter. At the moment, we don't have plans to travel either Thankgiving or Christmas weeks. Maybe we could combine a day or two of sewing with a few hours of kite flying (ending the event with the debut of the megamon). Man, this is one ambitious club!